Godzilla can be fairly said to be an iconic pop-culture super-monster. The name is pronounced with a very soft "d" in Japanese, almost to the extent it can sound more like "Gojzilla" most of the time. Created in 1954 he has had various different characters, sometimes the saviour of Japan and sometime destroyer of New York. And the movies contain probably some of the worst special effects ever created. But then maybe it was just ahead of it's time. The latest incantation has recently hit the silver screen around the world and will finally launch in Japan on 25 July, the 98th of 101 countries to be shown. Only fans in Angola, Bahamas and Bosnia have had to wait longer. We can assume it will be incredibly successful but even before it is seen by the stars at the premier it has already provided a wake-up surprise for the residents of Roppongi in central Tokyo. Midtown is a swanky development opened in 2007 that brought a much needed refresh to the old site of the Defence Agency including a hotel, offices, a labyrinthical shopping arcade that defies navigation and a very nice park used for skating in winter and picnics in summer. It's also where the occasional pop star is arrested for being somewhat inebriated and having forgotten his clothes earlier in the evening. And the relocation of the Defence Agency having the added benefit of no longer requiring Patriot Missile batteries to be stationed in the centre of nightlife every time the North Koreans decide to send a missile flying over the country. 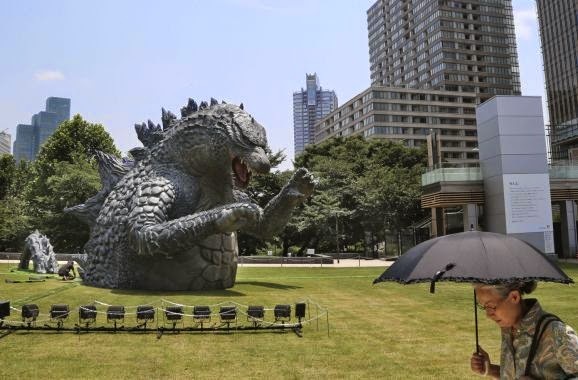 And then last week a 25 foot high Godzilla climbed out of the earth and came for a visit to the quiet and peaceful Midtown park.